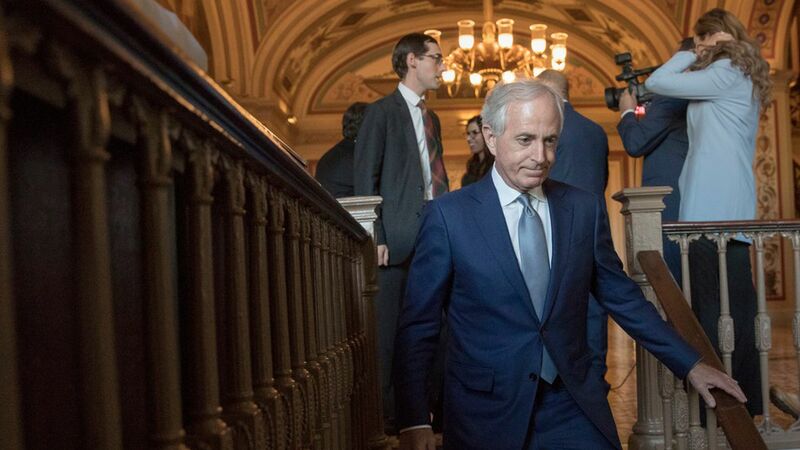 Senate tax bill could still fall apart over the "trigger"
The tax bill's fate in the Senate could rest on Sen. Bob Corker's "trigger" idea, which continues to be negotiated as the chamber debates the bill. But there aren't yet details on how it works, it may not comply with budget rules, and while it's being sold as a backstop to alleviate debt concerns, the vast majority of economists say the tax bill increases federal debt — meaning whatever the trigger ends up doing should be taken seriously. Why this matters: It means Senate passage of the bill isn't in the bag yet, although it's getting close. If the Senate succeeds with including the trigger, the tax bill's passage seems very likely. Conversely, if the trigger doesn't work out, it could imperil the votes of deficit hawks in the Senate even as other Republican holdouts fall in line. What we know: The deficit hawks are still negotiating a "trigger" that would take effect if the tax bill adds to the deficit or falls short of economic growth predictions. Other than that, we don't know a lot of details. The leading options seem to be a trigger that would increase taxes, including on the corporate side, or cut spending. Almost every reputable economic analysis has concluded the bill will add to the deficit. That means whatever gets triggered isn't just hypothetical. It will probably happen if it's based on deficit increases. "Since no credible economist believes that the bill will increase growth enough to generate enough revenues to offset the tax cut, any trigger that accomplishes what Corker et al want would be likely to take effect. Unless a future Congress waives it," Edward Lorenzen of the Committee for a Responsible Federal Budget told me. The trigger may not comply with Senate budget rules, lobbyists and experts warn — the so-called “Byrd" rule — which must be kept for the bill to only need 50 votes to pass. Whether or not the trigger complies is still being worked out. If it doesn't and isn't included, it puts at risk the vote of Corker and potentially other deficit hawks. If it is included, the specifics may lose other members who don't like the idea of raising taxes or cutting spending in the future, although this seems less likely to happen. If a future Congress did somehow end up letting taxes get raised during a period of slow economic growth, this could further hamper growth. Senate Republicans really want to pass this bill. We don't know what the trigger will do, or what would cause it to take effect. Congress could very easily waive it in the future, meaning it wouldn't tackle the deficit down the road but could get the tax bill across the finish line. A very similar scenario is already taking place, with members like Sen. Susan Collins demanding that Congress waive spending cuts already triggered by passing the tax bill.